Hasbrouck House’s dynamic portfolio of rooms, lofts and suites are located within three houses on the property: the Hasbrouck House or main building, the Stable House and the Carriage House. We also have a newly updated 3-bedroom private house on the property available for rent called The Cottage. Each offers elegant, yet understated accommodations and no one room is the same. 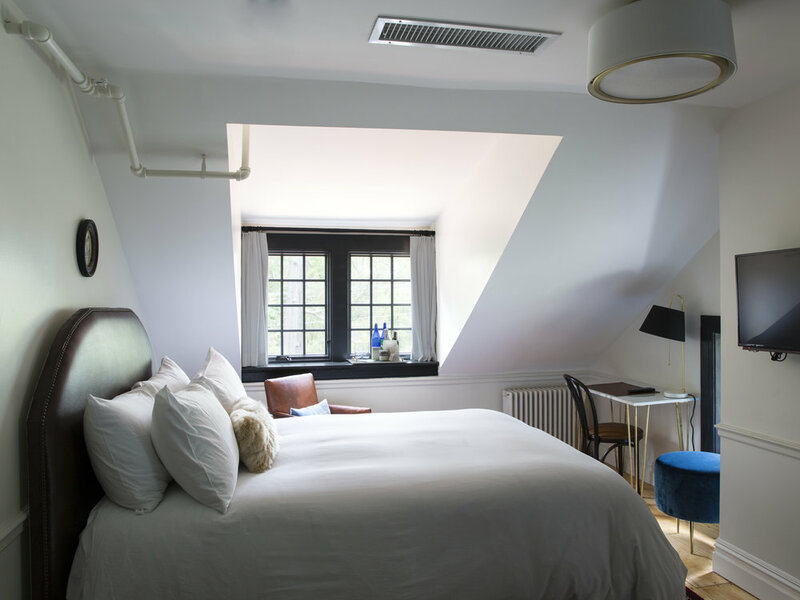 Beautifully designed in a palette of soft grays and blues, each room is furnished with a collection of both vintage and modern pieces, with large windows overlooking the stunning grounds. Rich finishes, Aesop amenities, in-room Nespresso machines and Frette linens create a cozy and luxurious escape. A rental of The Cottage is made complete with the same amenities that you’ll find in the guest rooms at Hasbrouck House. (Goose down pillows, Frette linens, Aesop soaps, Nespresso machines, and more.) Guests staying at The Cottage will have access to all hotel amenities including but not limited to the pool, Wellness Room, Club Room, and Game Room. Cottage rentals must be made over the phone and are not available online. Please call 845-687-0736 to book. Accommodates up to six guests. The Hasbrouck House Heritage Suite is a two-bedroom suite on the 2nd floor of the main building. It features one bedroom with a queen size bed and a bedroom with a queen size day bed and fireplace facade. This room also features a shared spacious bathroom with beautiful brick accents. Perfect for a family with children over the age of 12 or close friends. The Classic Rooms in the Hasbrouck House are spacious with large windows that overlook the front lawn and evergreens and feature a king size bed with big beautiful bathrooms with marble heated floors. Perfect for couples on a romantic getaway. Each room accommodates two guests. Our two balcony suites are situated in the main building just above the bar and restaurant so you'll never have to travel far for food or drink. These beautiful rooms have a queen bed, feature a lovely sitting area and of course, have Dutch Colonial balconies to enjoy. Perfect for relaxing in the fresh air year round. We have two Heritage Lofts located on the 3rd floor of the main building. Each loft is an open space with pitched ceilings, gorgeous light, and a California king size bed. Perfect for those who appreciate truly unique accommodations. Room 6 is a bit larger with two vintage leather club chairs which face a brick fireplace facade. 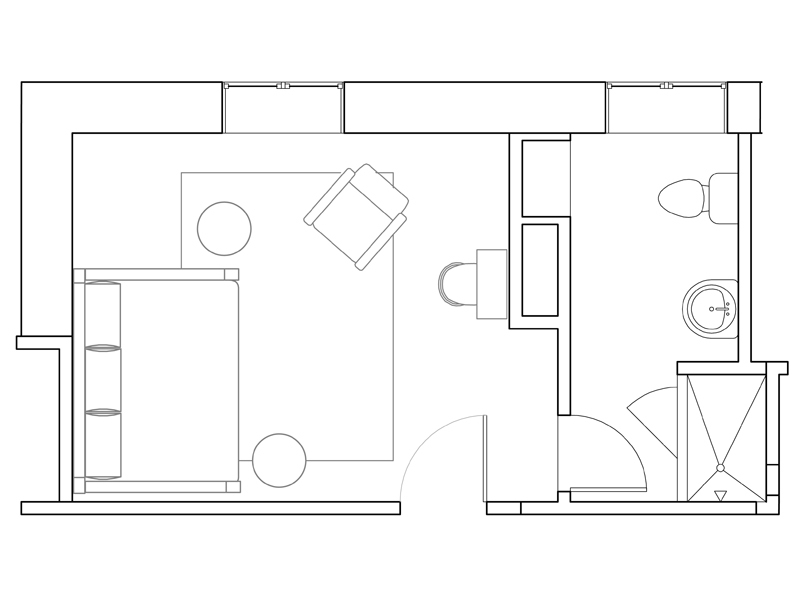 Room 10 is a spacious loft with seating area by the window, perfect for reading a good book! Each room accommodates two adults. Our Heritage Room is a quaint room on the third floor of the main building with a queen size day bed. This room has pitched ceilings, a cozy window seat, old world charm, a very spacious bathroom and is the perfect place for a cuddly couple. The Heritage Twin room is the perfect "friend suite" as it's the only room in the Hasbrouck House with two twin beds! Thoughtfully designed to maximize space, this charming and cozy room is perfect for guests not needing to share a bed. 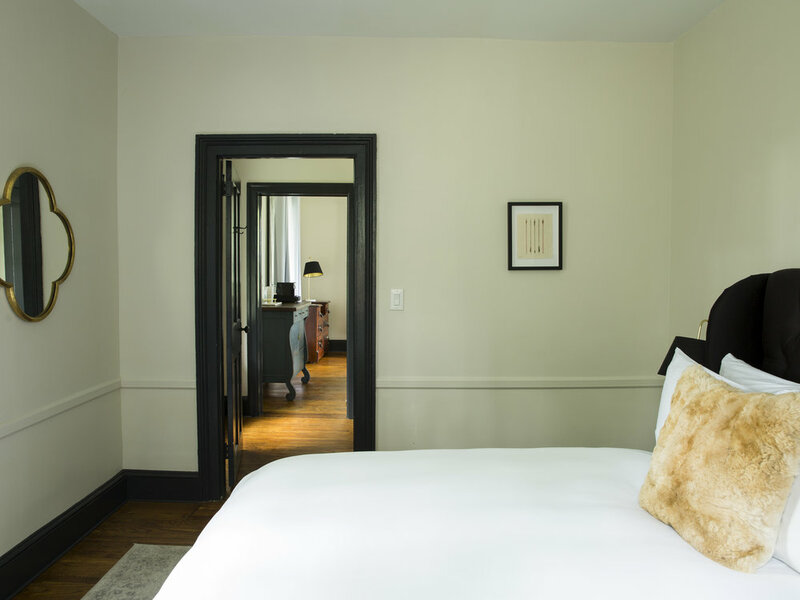 The Luxury Suite is on the ground floor of the Carriage House with a private entrance and one of our most romantic suites of all. It features multiple seating areas, a King size bed, in-room soaking tub with chandelier, gas burning fire place and large separate bathroom with walk-in shower. It's also perfect for guests wanting easy access to their accommodations. This Classic Suite is on the ground floor of the Carriage House, just behind the main building with it's own private entrance. 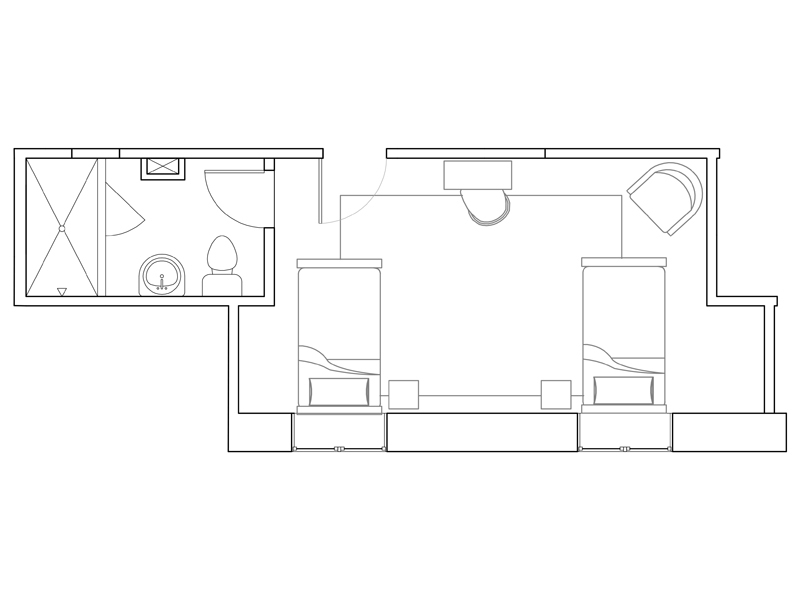 It features a seating area for two, a King size bed, kitchenette with mini-fridge and large bathroom. Perfect for guests wanting easy access to their accommodations. The Grand Suite on the 2nd floor of the Carriage House is the biggest accommodation on the property - a 3-bedroom suite complete with two full bathrooms, and large living room. It boasts a private entrance, large balcony with seating, spacious living room with kitchenette, master bedroom with king bed and ensuite bathroom, 1 bedroom with queen bed, and one bedroom with full size day bed, and shared bathroom. The perfect room for larger groups of friends or families with children over 12 years of age. The Carriage House Apartment is a private ground floor one-bedroom Queen bed apartment complete with living room that has panoramic views and a kitchenette with mini-fridge. This large suite has extraordinary light with unobstructed views of lawns and evergreens. The Garden Suite is one of a kind. Located on the ground floor of the Stable House it is a 2-bedroom suite including living room/bedroom with a king bed plus a full size day bed and a large covered private garden patio accessed through the main bedroom. Perfect for close friends or families with children over the age of 12. Accommodates up to four guests. The Grand Loft is on the 2nd floor of the Stable House and one of the most glamorous rooms of all - perfect for honeymooners or any romantic getaway! It boasts a large open space with vaulted ceilings, a kitchenette private, large bathroom with gorgeous soaking tub, and a king size bed. This suite also includes a separate private bedroom with a queen size bed.